Enjoy your stay at our beautifully decorated 3 Bedroom (King, Queen, 2 Twins), 3 Bathroom townhome that comfortably accomodates 8. We also have a Queen sized sofa sleeper. 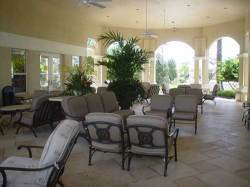 Included is a south facing screened in private splash pool and spa all facing a beautiful conservatory. This unit is the closest to the multi million clubhouse and lagoon style pool. (see below for additional amenities). Summer Wind is a three bedroom, three bath, professionally decorated townhouse with everything you need for that perfect sun filled vacation. 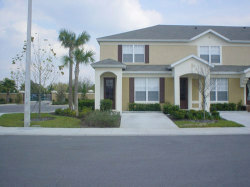 Located in beautiful Kissimmee Florida, Summer Wind is a luxurious townhome within a 5 star gated community. 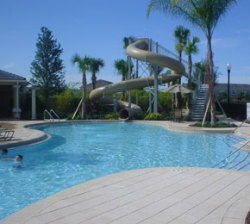 It is located just 1.8 miles from the gates of Walt Disney World and conveniently accessible to I92. Summer Wind is truly "the closest to the Magic!". Summer Wind is available for rental year round - nightly, weekly or monthly. Renting a luxury vacation villa for the price of a single hotel room is possible at Summer Wind. Summer Wind features a truly stellar clubhouse and outdoor spa, tropical style pool complete with waterslides and a tot lot for the young ones. The family friendly 5 Star gated community offers excitement and relaxation for both young and old. 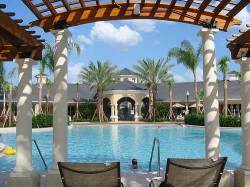 All just minutes away from Walt Disney World and other Florida attractions. Balance to be paid - 30 days prior to sta to arrival.